I already mentioned the major changes of Windows 8.1, the next iteration of Microsoft's operating system that will be made available to the public on October 17th. One that deserves more coverage is the firm integration of other Microsoft services and products in the operating system. We know that Skype will be integrated natively in Windows 8.1, and the same is true for Microsoft's cloud synchronization service SkyDrive. After you have installed Windows 8.1 on your system or upgraded an existing copy of Windows 8 to the operating system, you will notice that SkyDrive is displayed prominently in File Explorer. For those new to Windows 8, File Explorer is the new Windows Explorer name. You may notice differences between the native SkyDrive implementation and SkyDrive that is installed as an application on the system. First of all, most files are not made available for offline use right away. This is very similar to how Google handles Google Drive contents. The availability column in File Explorer highlights if files are available offline, or only online. 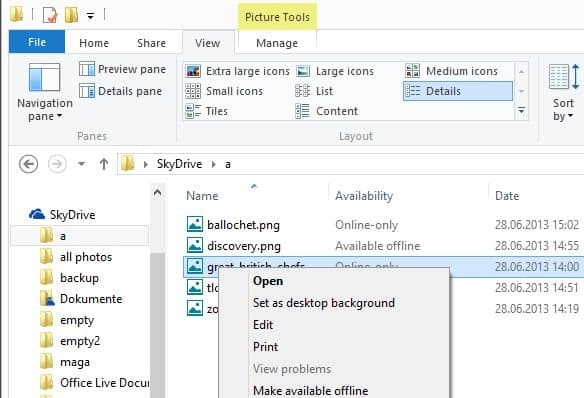 You can right-click folders or files here and select make available offline to transfer the files to the local system so that you can access them even without Internet connection. Files that are offline available can be changed to only online the same way. SkyDrive's default location on Windows 8.1 is C:\users\username\SkyDrive\. It is still possible to map the SkyDrive folder to another drive letter and path on the system, but it is not really necessary anymore, as you can now make use of a built-in solution that allows you to move the SkyDrive folder. Files in the SkyDrive folder are stored in the target location below. You can change where files in this folder are stored to another place on this hard drive, another drive, or another computer on your network. To move the folder click on move and select the new target destination for all SkyDrive files that are available offline. That is for instance handy if the main drive is running out of space, or if you want the SkyDrive files to become available on a different drive for other reasons. You can restore the default location at any time with a click on the restore default button in the same interface. A couple of things are noteworthy here. First, you can move the SkyDrive folder to a network share which can be useful if the PC you are working on has not enough space to hold the data that you want to make available offline. Second, it is really easy to move the SkyDrive folder now. You do not need to use virtual links anymore to do so, as it is now natively built-into the service. And users who do not want to use SkyDrive can disable the feature during setup. Did you know that Skype require a Microsoft account from all new users (will be required for all users in the future) on all OS platforms (Windows, Android, iOS, Linux,OSX) ? Wow thats great!! But can we upgrade it if yes then how! Network locations are not allowed for Skydrive storage. Update of this article to reflect that would be appropriate. 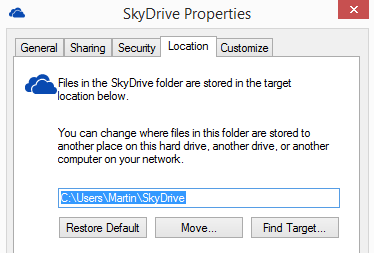 When you change the location of “C:\users\username\SkyDrive\” to another location, you want to include the folder name of “Skydrive” (or change the name, of course) in the target location. For example, if you want to move to D:\ then you MUST say “D:\Skydrive”, or else it would put files into the root of that drive, which would automatically include other folders!. Second, even if you move from one location on “C:” to another on the same drive, it does a FULL COPY/DELETE cycle of all files instead of just changing the file descriptor. The move is very poorly implemented by Microsoft, IMO. So, a lot of files can take a long while to “move”. It took over 15 minutes to just move my 50,000 files. This is also a bad thing for SSD drives! Thankfully, it doesn’t have to re-upload all the files at least.